February is blowing in with the wind, wild and reckless. The air is warm, and the heavy snow is disappearing as fast as it can. Streams of water run down the mountainside, and farmers in the valley below are upbeat and hopeful about this year’s crops. We will have high water tables to nourish those fields of plenty. I’ve had a good week. My Sunday school craft went over well with the kids, thanks to the abundance of ideas at the website Krokotak.com. 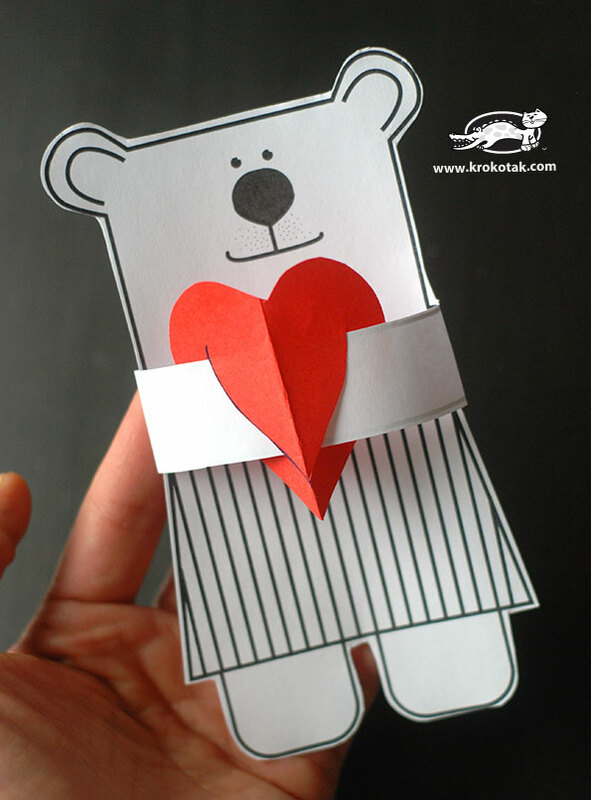 We did a cute little bear that holds a heart. I modified the hear t to say “Jesus Loves You”. I only had boys in the class today, very unusual but fun. They sputtered a bit when they thought the bear had on a skirt instead of just an apron, so several of them modified the apron to look like a pair of shorts. Can you tell the boys are all very young? 1st, 2nd, and 3rd graders. Being a Sunday School teacher is not something I would have EVER imagined that I would be. But when we want to hear God laugh, all we have to do is tell him our plans. He puts us where he needs us. I have used three poems from other artists as Word Art. If you have an opportunity, I encourage you to follow Christopher Poindexter on Instagram and Tumbler. He also has a store on Etsy. His typewritten poems can be rather stirring and lovely. I also used a sweet poem from John Mark Green. I will have some additional downloads for you within the next few days. Thank you so much for your fun mini-kit! God’s love is truly the best to celebrate any day and I loved your bear idea for S.S kids! Thanks for investing in young lives! Beautiful colors!!! The kit is gorgeous!!! Thank you so much for sharing!!! This is so pretty Sunny! Don’t worry about the green … I know it’s not what you intended, but it’s still beautiful. 🙂 Thank you so much for sharing your talent. It appears to me that the wind has blown a lot of the results of your talent to be shared with all of us. ‘Love is in the Air’ and I love your work! Thank-you so much.